This challenge features lively citrus colors to inspire you — In the Buff, Orange Fizz, Green Room, and Dill Pickle. 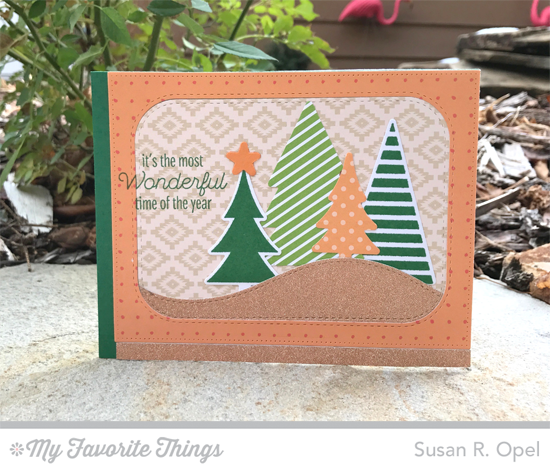 The whimsical striped trees in our Oh Christmas Trees stamp set make for a delightful holiday greeting when paired with snowy copper accents. And if you don't have the exact card stocks and inks for any given color challenge, check out your patterned papers from My Favorite Things. This handy guide will help you with color matching! 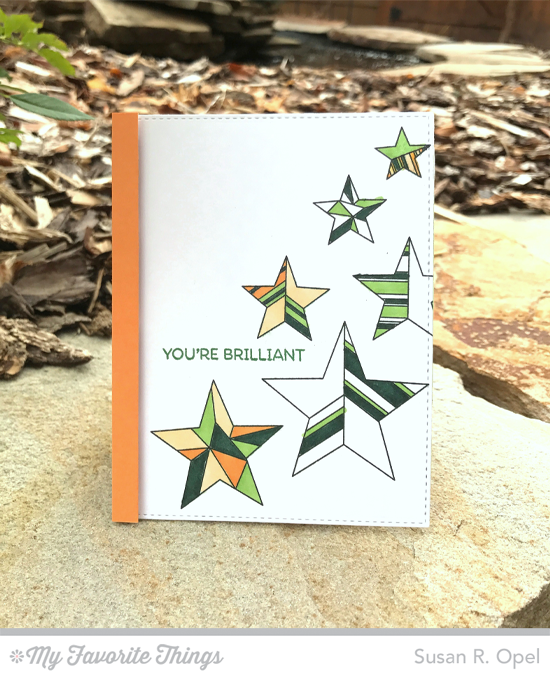 Stamp several stars from the brand new Stars Above stamp set and color them with markers to achieve a graphic look with this color combination. Add a strip of Orange Fizz card stock to finish it off! Congratulations, Pam Tretreault! You are the randomly selected winner of the MFT Color Challenge. You can view all the entries from the last challenge HERE. You have until Wednesday, December 21st, at noon EST to add your link and be eligible for the prize of up to $20 in MFT Cash. Winners are chosen at random, so everyone has a chance! The prize is a $15 Gift Voucher to My Favorite Things, but if you use MFT stamps and/or dies in your project, you’ll receive an extra $5. Great cards for the color challenge.